it was a tournament full of good, competitive tennis, played in a very happy atmosphere. There were two new faces on court, Elvira Campione and Ashley Lenihan, they both got to two finals - a very good start to their careers at the British Open and we look forward to seeing them next year. It was good to see the up and coming young players, Tara and Jess, improving so much, as well as seeing the high standards the top players have reached. We wish them all the very best of luck in the World Championships in Paris. 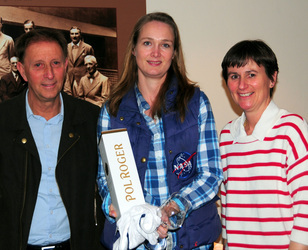 Many thanks to our sponsors, Neptune Investment Management and the very much appreciated champagne donated by Pol Roger. Thanks must go to Seacourt, for being such good hosts and for the excellent dinner enjoyed on the Saturday night. Special thanks go to Dan Jones and Adam Player for all their hard work before and during the tournament. They marked from the net despite sometimes feeling that the players might be under the misapprehension that points could be won by hitting the marker - but fortunately no harm was done by the mishits that whistled into the marker’s box! Thanks too to Alex Garside, Viv Dawes and Lucy Hutchinson (who gave much support behind the scene with the programme etc.) for organising the tournament so well. 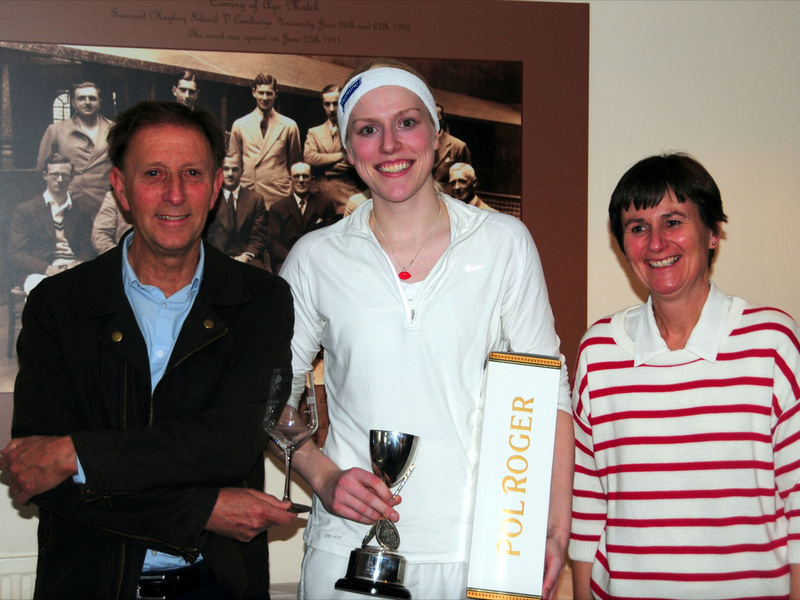 The entrants and supporters converged on Seacourt again for the British Open and were made very welcome at the club that is considered to be the home of Ladies Real Tennis. Hopes of high quality tennis and closely fought matches were not disappointed, the standard of play is improving year on year. 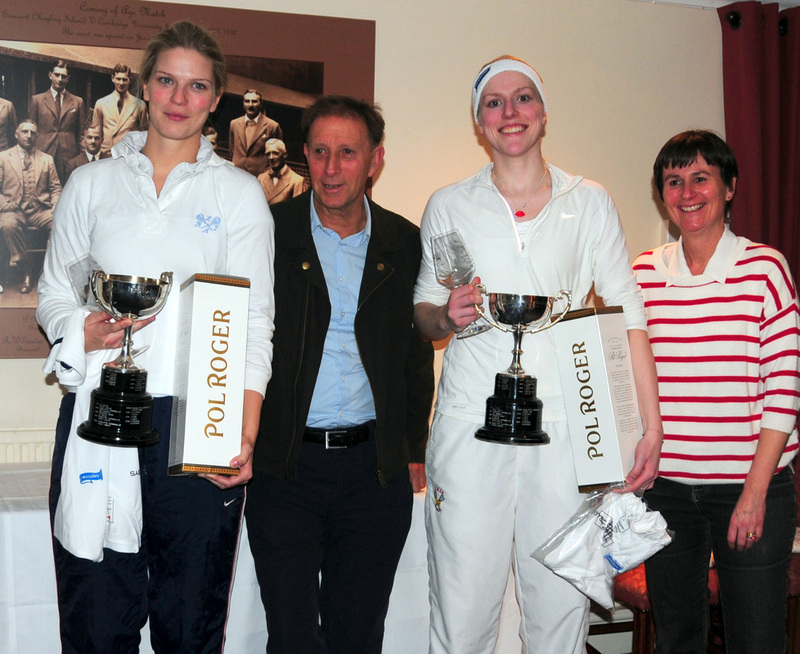 The questions were whether anyone would be able to challenge Claire Vigrass in the singles and Claire and her sister, Sarah, in the doubles, and how would the up and coming Tara Lumley and Jess Garside fare? Claire at the presentation. Thanks to Tory Wall for the photo. The early rounds went as expected with the stronger players not being troubled. In the quarter finals Karen Hird, nursing a recently sprained ankle (what wretchedly bad timing for the usually fighting fit Karen) faced her doubles partner, Freddy Adam, but the injury forced her to retire in the first set. Next on court were Penny Lumley and Sue Haswell, as expected, this was an excellent match, although Sue only won 4 games, most games went to deuce and every point was hard fought. 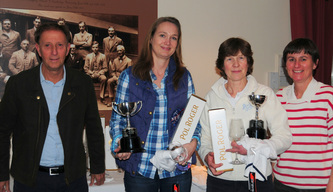 Sue never gave up but Penny proved too strong in the end, winning 6/1, 6/3. Then came Sarah Vigrass against Alex Garside, this too was a good match but Sarah was very powerful, with some excellent shots particularly on her backhand and home court advantage could not save Alex. Sarah won 6/2,6/0. Claire Vigrass’ first opponent was Tara Lumley - what a challenge for Tara, and she played really well, getting to 30 love up in a number of games but Claire then cut the ball into the corners. Tara has certainly improved over the last year and is a player to watch, although she did not win a game, she never gave up and produced some strong strokes. The first semi final saw the contrasting styles of Claire against Penny. Although Penny played really well and fought for every point, Claire proved too strong for her. There were very many really hard, cut shots from both players and Penny got to 30 love several times but failed to make the final point each game. Claire went on to take the match 6/0 6/0. The other semi was Sarah against Freddy which proved closer as both players hit hard, cut shots from corner to corner but again the Vigrass skill came out and Sarah won 6/3 6/2. So the final was a family affair, could Sarah dethrone Claire? Sarah started strongly, winning the first two games. 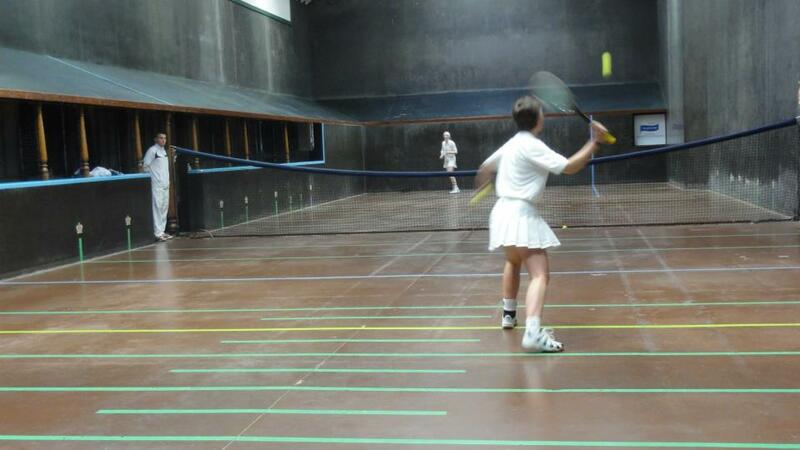 Claire then settled down, began serving more tightly and made more winning shots. Both played a number of stunning ‘on the run’ shots, they cut the ball from corner to corner and laid very good chases. Sarah had a game point to go to 3/4 from 2/4 down but Claire took this very long seventh game. Sarah took the next game so it was then 3/5 to Claire, who clinched the next game and the set. Sarah bounced back to win the first game of the second set but after several hard fought, close games Claire powered her way to win the set, the match (6/3,6/1) and retain her trophy - a truly exceptional champion. 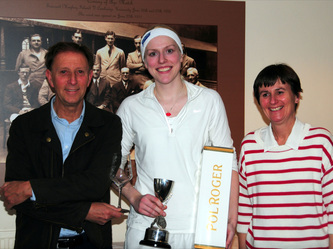 Many thanks to Tory Wall for the photographs of the presentations and to Simon Flynn for those of the action on court. 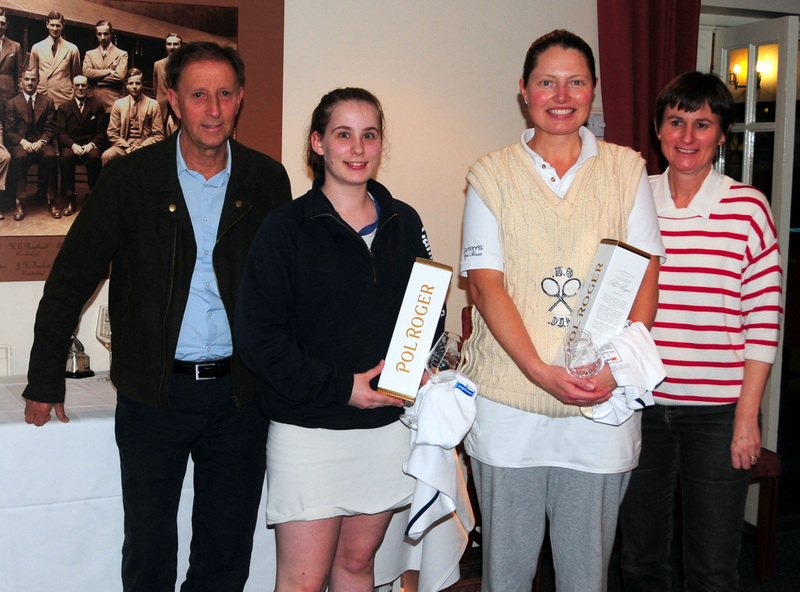 In the first round match in the top half of the draw Jess Garside and Nicola Doble proved too strong for Pam Tomalin and Chantelle Harding. The younger ones played so many cut shots and really good volleys that Pam and Chantelle found they could not get a game with the girls winning 6/0 6/0. 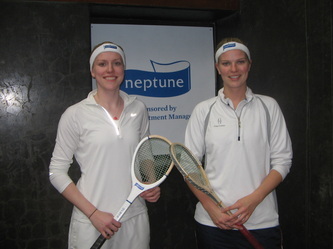 In the next round Jess and Nicola played Penny and Tara Lumley, it was a good match, with the Lumleys being too strong for their opponents and winning 6/2 6/1. 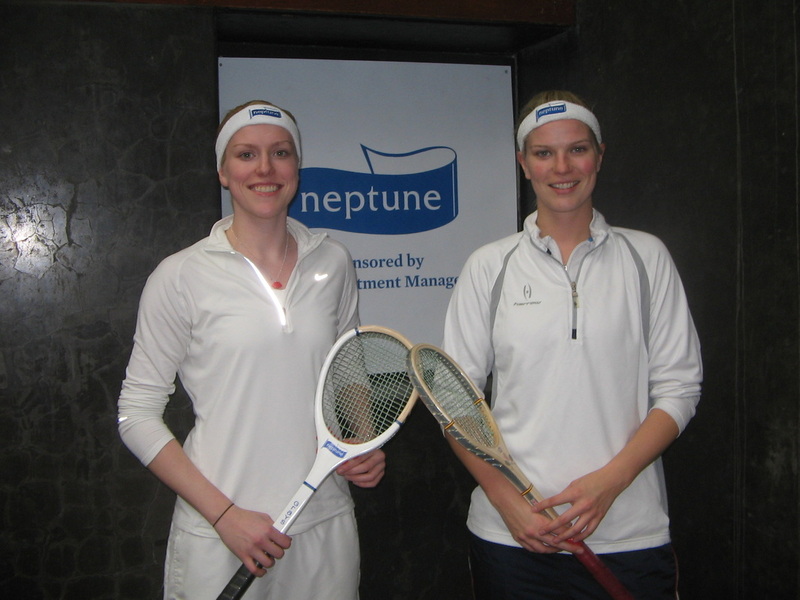 Their reward was a match against the holders, Claire and Sarah Vigrass, who played their usual strong game to win 6/0 6/0 and go into the final. The first match in the other half of the draw saw newcomer to the Open Elvira Campione playing with Lucy Hutchinson against Alex Kurkjian and Elli Harris. Elvira and Lucy went off to a 2/0 start with the others not getting a point but then Alex and Elli settled down and went on to win 6/2 6/0. Both Alex and Elli played the volley really well and although the game was closer than the score indicated, they were too strong for the other two. The other first round match in that half pitted the local duo of Linda Medlow and Caroline MacDowell against Jacqui Watkins and Ashley Lenihan (another newcomer to the Open), the local ladies won 6/4 6/2 but, despite putting up a good fight, then lost to Karen Hird (making light of her injured ankle) and Freddy Adam 6/2 6/3. 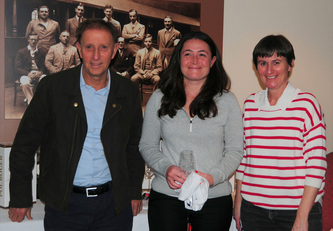 Karen and Freddy reached the final by beating Alex Garside and Sue Haswell in a match where the rests were fast and furious, with many low volleys. 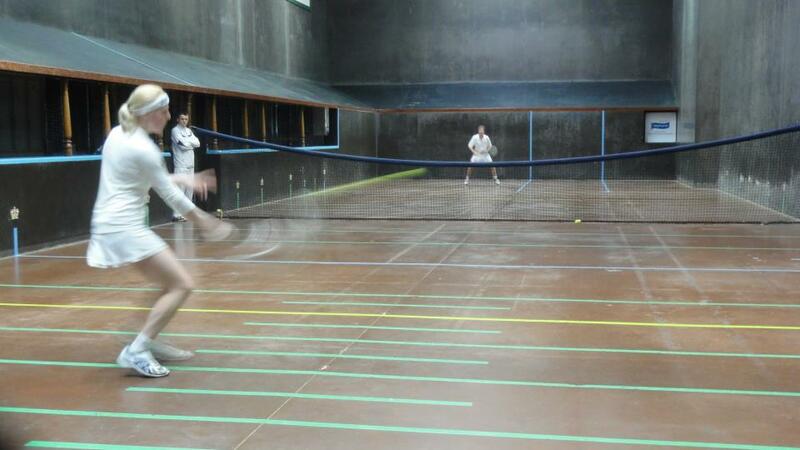 Karen and Freddy proved better at finishing the rests to their advantage, often with a killer volley, and won 6/2 6/3. 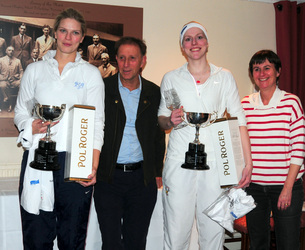 So the final was a rerun of the 2012 final with Claire and Sarah playing Karen and Freddy. This time Karen and Freddy managed to get one more game than last year. This match produced some tremendous tennis. Claire was fearsomely fast and seemed able to return anything and everything, finding the winning gallery and the grille on numerous occasions. She also found a gallery whenever she and Sarah wanted a chase to recover the serve. 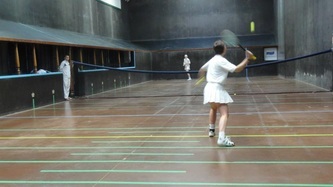 Sarah produced some splendid cross court volleys and ground strokes. Karen and Freddy fought the whole way, making some great retrievals and excellent volleys but were unable to stop the Vigrass pair, who took the first set 6/3. Claire and Sarah monopolised the service end in the second set and were 5/2 up when Freddy saved a match point, she and Karen won the next point to give themselves game point but Claire responded with a winning gallery and she and Sarah then took the game, the set and retained their title. They really are a formidable pair, but credit must go to their opponents too, who fought the whole way, and especially to Karen, who was hampered by her sprained ankle. 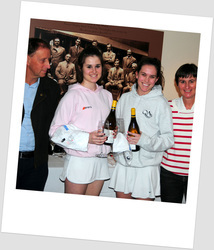 The first semi final saw the doubles pair of Elvira Campione and Lucy Hutchinson facing each other across the net. Elvira proved too strong for Lucy, who fought the whole way but only managed to win one game. The second semi was the more evenly matched pair of Pam Tomalin and Ashley Lenihan. Having lost the first set 6/1, Pam fought back to 5/5 in the second, but Ashley took the next game and earned a place in the final. Elvira started well in the final, going 4/1 up. Ashley then fought back to take the next game and got to deuce and then game point in the following one, but Elvira held her nerve and went on to take the game and then the set. Ashley won a game early in the second set but Elvira had got into her stride, using shots into the hazard forehand corner and cross court returns of serve to good effect and she won the title 6/2 6/1. 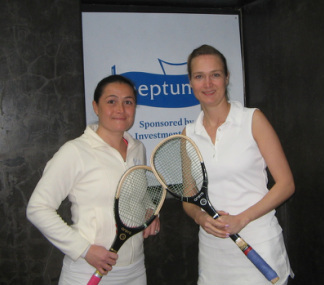 Jacqui Watkins and Ashley Lenihan reached the final by beating Chantelle Harding and Pam Tomalin 6/4 6/2. So the final was between Jacqui and Ashley and Elvira Campione and Lucy Hutchinson. Ashley and Elvira had played their singles plate final immediately beforehand, so had their eye in, even if they were a little puffed! 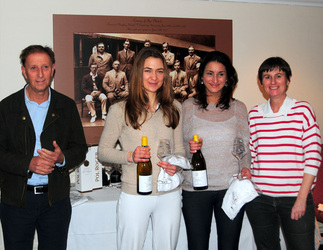 They were the stronger players but Jacqui and Ashley certainly held up well. Elvira & Lucy proved too strong in the first set, winning it 6/1. Ashley and Jacqui started the second set well, taking the first two games but then Elvira and Lucy came back to 2 all and went on to win; the match was harder fought than the 6/1 6/3 result might indicate. There were 2 groups of 4 pairs. In the first there were some huge handicap differences, so the players were glad that they could leave the scoring to the markers! The group produced some very tight matches, in particular the last one which saw Alex Garside and Nicola Doble giving 18 points to Elvira Campione and Lucy Hutchinson, it went to 5 all, 40 all, with Elvira and Lucy just clinching the last point to finish as group winners, with Alex and Nicola the group runners up. In the second group the pairs were more evenly matched, again there were some very close matches. In 2 of these the winners had to fight back from 1/4 down. Tara Lumley and Jess Garside (the holders) took a while to get going against Caroline McDowell and Linda Medlow, but finding themselves 1/4 down they woke up, fought back and won 6/5. The same thing happened when Alex Kurkjian and Elli Harris played Jacqui Watkins and Ashley Lenihan, the former making a comeback from 1/4 to win 6/5. In the first semi final Elvira and Lucy seemed on course to win, at 7/4 up, but those comeback kids, Alex and Elli found their serves, the centres of their racquets and held their nerve to win 8/7 in an exciting match. 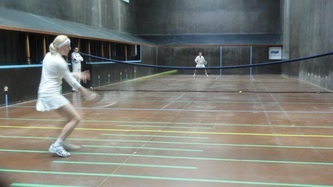 The second semi pitted mother v daughter, with Alex and Jess Garside on opposite sides of the net. The standard of play was high and it was neck and neck to 4/4 but then Tara and Jess managed to pull away beating Alex and Nicola 8/4. The final was one of those matches where the score does no justice at all to the closeness of the match. Tara and Jess and Alex and Elli are all keen and effective volleyers, there were some fast and furious rests and great retrievals, especially from Tara and Jess low in front of the tambour. The first 6 games went to 40 all, with Tara and Jess always winning that crucial game point. Then Alex and Elli came back and took the next game to love but Tara and Jess produced some winning shots to take the next 2 games to win the match and retain their title. Although the game score was 8/1, the more telling statistic was that there were only 7 points between the winners and the runners up. It was great to see 4 young players producing such good tennis.